With the slogan “Hello Industrie 4.0 – We go Digital” KUKA is going to welcome it’s visitors at the Hannover Messe 2016 taking place from 25 to 29 April in Hanover Germany. KUKA will showcase numerous solutions in the sector of Industry 4.0 and will present also a world premiere. The german robot and system builder will continue to focus on Industry 4.0 and to demonstrate practical applications with real customer benefits for diverse areas of life. New products for new markets, innovative applications from the robotics research community and, not least, the partner country USA will play a major role at this year’s trade fair appearance. What is more, KUKA will be unveiling a world premiere at Hanover. At the KUKA booth in Hall 17 in the Industrial Automation area, visitors to the 2016 trade fair will not only be able to experience turnkey solutions and applications for Industry 4.0 – where conventional high-tech industry solutions go hand in hand with the latest services from the IT world – but they will also witness a world first. At the world’s largest industrial trade fair, the Augsburg-based robot and system builder will debut the prototype of a new robot generation that is perfectly equipped to handle the demands of one of the biggest growth markets for automation: the electronics industry. For years, KUKA has cultivated close business relationships with the USA, this year’s partner country at Hannover Messe. 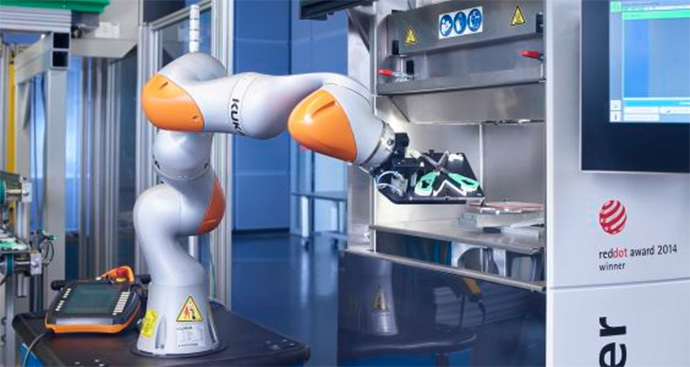 This includes systems engineering from KUKA Systems, robotic solutions from KUKA Robotics and cell solutions from KUKA Industries, and logistics and healthcare applications from Swisslog, the youngest member of the KUKA Group. In North America, KUKA employs nearly 2000 people. A new partnership between KUKA Roboter GmbH and a US welding company underscores KUKA’s relevance and strength in this important automation market. Photo by KUKA Robotics Corp.
For the third time KUKA will be presenting the Innovation Award at Hannover Messe. The competition for the 20,000-euro prize aims to accelerate innovative developments in the field of robot-based automation in the broadest sense and to promote technology transfer from research to industry. In Hall 17 right next to the KUKA booth at the trade fair in Hanover, the six finalists will present their innovative robot applications and components related to the topic of “flexible manufacturing” using a mobile LBR iiwa called the KUKA flexFELLOW. Everyday problems facing end users will be solved in realistic settings and new key technologies and components will be developed and demonstrated. The international jury of experts will crown the winner of the Innovation Award at the trade fair. KUKA press conference at Hannover Messe 2016 with CEO Dr. Till Reuter on Tuesday, 26 April 2016 directly at the KUKA booth (G04) in Hall 17 at 10:00 a.m.